Patio Heaters. Review for the garden and patio. The market for outdoor living is expanding as we become more social in our culture. One of the favourite new lifestyle changes is to extend the seasons by placing a garden patio heater on the terrace. There are various types of garden patio heaters which can be fuelled by gas, coal, wood and electricity. These can range from free standing, fixed/plumbed into the ground, table models, wall units, and pit/basket types. Due to the ease of use and versatility, the most popular type is the free standing gas model. There are various free standing models on the market but the important features to look for are highlighted below. Cheaper than Argos, full backup and spares. This can be described in KW or BTU/h's (British Thermal Unit). It is worth checking the BTU's, this is the engine size and a more accurate way of understanding how much heat will be generated. Table models often have low output; standing models should have a min 35,000 BTU up to 45,000BTU. Anything higher will only marginally increase the available heat but will cost more to run. Some garden patio heaters only offer a high and low heat setting. Always look for variable heat control. Patio heaters in the left hand picture are the same as supplied for home users. 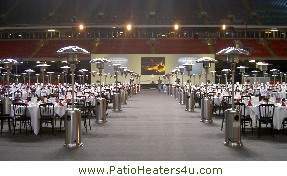 This picture was taken at the Millennium Stadium (home of Rugby) and all the patio heaters were supplied by PatioHeaters4u. If they can do this for the Dome, you can trust them to supply your patio heater! Garden patio heaters fitted with a flame failure device are common now. Not all models though are fitted with a tilt safety shut-off. This device will cut the supply of gas should the heater lean/tip over. It is unadvisable to situate garden patio heaters on a slope, they should be placed on firm, level ground. But should someone try to move the heater when it's lit then the tilt switch will cut the gas supply. Stainless steel is the most popular finish - for the lazy gardener this is the best option. Stainless steel can be left outside without fear of rust or corrosion to spoil the look. Powder coated models are available in a variety of colours and should be protected by using a full length cover. This will keep the worst of the weather off and prevent fading, scratches, and the potential for rust. The third alternative is hammered finish, this will weather well and can be obtained in various colours.